Its basic formula consists of an analysis-control mechanism (built in Super Collider) residing inside a computer to which a real-time mainstream radio broadcast is fed. This mechanism acts as a reversed-noise-gate, singling out what is usually ignored or avoided in a radiophonic context (whispers, stumbles, pauses, dead spaces and errors) and muting all the other sounds such as words or songs. These punctuating fragments become the raw materials from which Radio Fragments’ sonic concoction is brewed. André Castro (b.1983) is a sound artist from Lisbon, graduated in Sonic Arts at Middlesex University(U.K). André’s practice has been shifting between two different universes. On the one hand, the computer music world, with its meditative textures, harsh noisy sounds, blips, and experiments with custom-built software in SuperCollider. 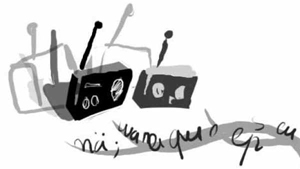 On the other hand, a phonographic activity, in which he goes out with a microphone trying to capture the incredible aural diversity of our world and the voices and stories that hide in each person. Most of André’s work has in common the evasion of visual elements, an acousmatic sound that aims to subvert the dominance of the vision over the other senses. In recent years he has nourished a growing interest for the radiophonic medium, which has become a fruitful source of inspiration and for which he has been creating pieces since the last 3 years.